Sometimes the internet is used to better humankind, but just as often it's utilized by hoards of gremlins to spew verbal bile in the form of hate speech, misogyny and words of straight-up ignorance. A “reporter” decided to ponder if a recent photo of the ravishing Rihanna meant that the singer is getting fat. Though it's now been taken down, the body-shaming article in question — entitled “Is Rihanna Going to Make Being Fat the Hot New Trend?" — was based a recent paparazzi photo showing Rihanna with what appears to be a slightly more-curvaceous-than-usual figure. The photo got mad love from the Navy and all the followers of #thickanna hashtag, the body-positive alter ego that Rihanna herself created when a fan asked her if she had been gaining weight a few years ago. But the photo also brought out the fat-shamers by the hundreds. Unsurprisingly, the internet decided that it would have none of that and decided to give the Barstool Sports writer a taste of his own medicine by trolling him hard. 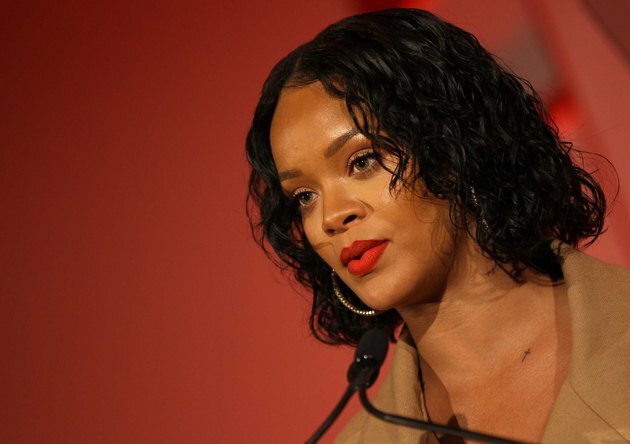 The writer soon learned that being made fun of by strangers on the internet isn’t all that fun and took to Twitter to complain about Rihanna fans “cyberbullying.” Is the irony is palpable or what? Rather than asking inane questions that only serve to put a negative spin on the changes of a woman's body, we should be commenting on things that actually matter about the singer — like the fact that she earned herself a Humanitarian of the Year Award from Harvard University for her extensive philanthropic work. I've yet to come across one male employee at barstool that isn't shaped like a lump of raw dough so congratulations you played yourself. And a word of advice to the Barstool Sports writer: Don't dish it out if you can’t take it. Better yet, just don’t dish it out at all — especially if it’s about someone else’s body. Whether or not Rihanna embraces #thickanna, we're still fans. Can you believe this writer fat-shamed Rihanna? What do you do to avoid negativity on social media? Let us know in the comments.